A Travellers' Railway Map of Europe from Carto Studio presenting the Continent in a series of six maps and their enlargements, including 12 city maps indicating locations of their main railway stations and a map of the high-speed network. On one side it an overview map of Europe at 1:3,800,000, with coverage extending north to Oslo and Stockholm and east to Warsaw/Budapest/Dubrovnik. 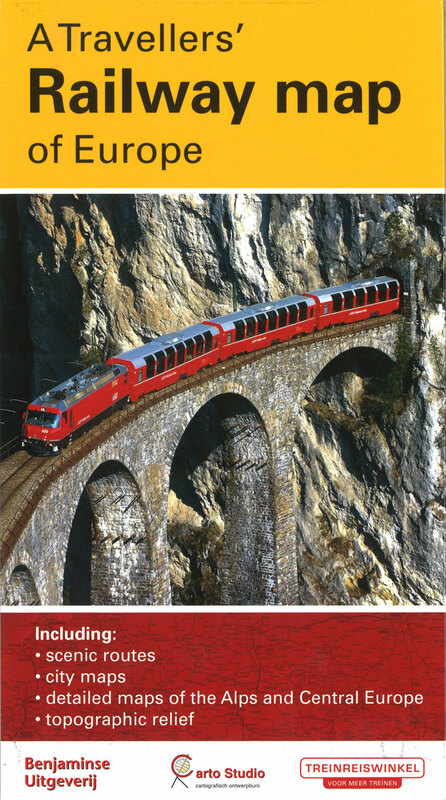 Railway lines are classified as high-speed, main or secondary, narrow gauge, tourist and rack railways. Each line is shown stations as allowed by the scale of the map. 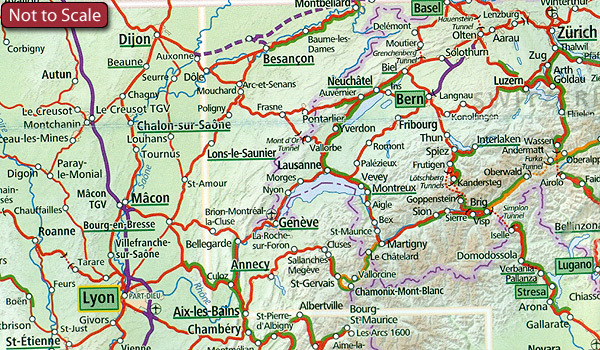 Interesting towns are highlighted and national borders are clearly marked. The map also shows train-ferry and passenger ferry services and locations of international airports. City names are in the language of their country (Warszawa, Roma, Firenze, etc). Two panels at a reduced scale extend coverage of the main map to the whole of Scandinavia and eastwards to Moscow and Ankara. 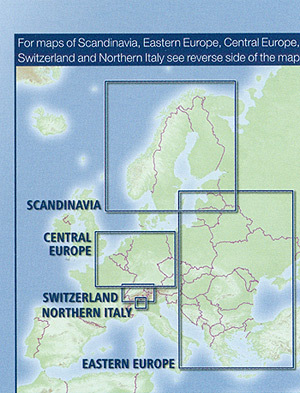 Enlargements present in greater detail: Central Europe from London to Prague and north/south to Hamburg and Munich; Switzerland with the adjoining regions of the neighbouring countries; plus the Italian Lakes with Milan. 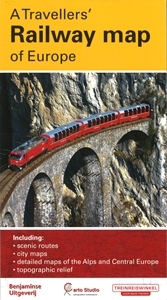 Also provided is a map showing Europe’s High Speed network with connecting lines, plus street plans of Barcelona, Berlin, Brussels, Budapest and Dublin, London, Lyon, Milan, Paris, Prague, Rome and Vienna indicating locations of principal railway stations and main tourist sights. Map legend and all the text are in English.